Okra growing shrub of the genus Abelmoschus and also known as Bamia or Gumbo, Okra evergreen perennial but in a cold weather become deciduous or grow as annual plant and also used as ornamental plant, Can grow in mediterranean, subtropics, temperate or tropics climate and growing in hardiness zone 11+ as perennial or 4+ as annual. Bamia leaves edible fleshy leaves with 5-7 lobes, sometimes the lobes very prominent and sometimes barely visible, depending on the species and conditions of growth, the leaves can reach to 15 cm. Fruits are edible can be in the color green or red. 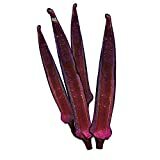 Seeds can be used as a substitute for coffee. 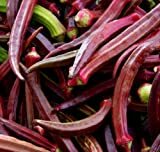 Hill Country Red Okra , Bhindi , Gumbo , Abelmoschus Esculentus, Texas Heirloom! 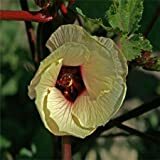 10 Seeds Hill Country Red Okra , Bhindi , Gumbo , Abelmoschus Esculentus, Texas Heirloom! 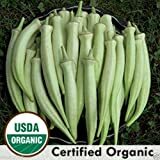 30 Seeds Okra Seeds, "Silver Queen" , Organic -(Abelmoschus Esculentus) Heirloom ! 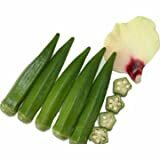 What can be done with big quantities of Okra fruits?